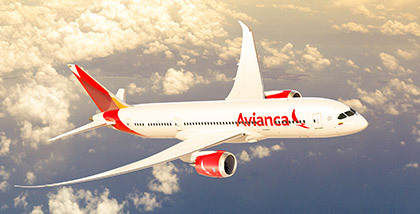 On October 7th, 2009 Aerovias del Continente Americano-Avianca and TACA with its subsidiaries announced publicly their mutual interest to merge both companies to further strengthen strategic position in the region and to help improve capacity growth. On February 2010, this strategic alliance was finalized under AviancaTaca Holding S.A. marking the beginning of a rigorous process of administrative re-organization, network integration, equivalent processes and synergies. On March 2013, AviancaTaca Holding S.A. general stockholder assembly approved the change of article number one (holding name) from AviancaTaca Holding S.A. to Avianca Holdings S.A as investment firm. Avianca Holdings S.A, is an investment firm that works as instrument for agreement execution between stockholders, allowing the integration between Avianca and TACA, also represents the integration of other airline companies that operates domestic and international routes, in which the firm acts upon them as a holding controller: Aerovías del Continente Americano S.A. Avianca (Avianca), Tampa Cargo S.A registered in Colombia, Aerolíneas Galápagos S.A (Aerogal) registered in Ecuador, and Grupo TACA companies: TACA Internacional Airlines S.A, registered in El Salvador; Líneas Aéreas Costarricenses S.A (LACSA) registered in Costa Rica, Transmerican Airlines S.A. (TACA Perú) registered in Perú, Servicios Aéreos Nacionales S.A (SANSA) registered in Costa Rica, Aerotaxis La Costeña S.A, registered in Nicaragua and Isleña de Inversiones C.A. de C.V. (ISLEÑA) registered in Honduras.